Do you have localized pockets of stubborn fat that refuse to disappear, despite your best efforts of diet and exercise? If you have struggled to achieve the body contours that you desire, liposuction with a body-contour expert like Dr. Lista, Dr. Ahmad or Dr. Austin might be the right solution. Over the past decade, liposuction, also known as “lipoplasty” or “suction lipectomy,” has benefited from several technological advancements that improve results, reduce recovery time, and improve safety. At the Plastic Surgery Clinic we perform approximately 150 to 200 liposuction procedures per year. This makes Dr. Lista one of the most experienced liposuction surgeons in Toronto, Ontario, and throughout Canada. Dr. Lista, Dr. Ahmad and Dr. Austin have one main objective: to make all of their liposuction patients look soft and natural while performing the operation as safely as possible. To provide patients with more precise results and quicker recovery times, Dr. Lista, Dr. Ahmad and Dr. Austin ensure they are up to date with the most recent techniques in the liposuction area. When Power Assisted Liposuction (PAL) was first introduced, Dr. Lista was one of the first surgeons in Canada to use this technology. 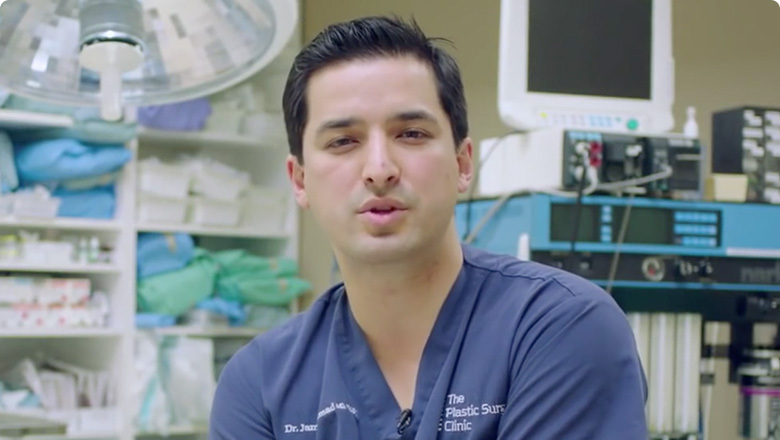 As leading plastic surgeons, he, Dr. Ahmad and Dr. Austin have expertise in all manner of liposuction procedures, including ultrasound-assisted lipoplasty (UAL), the tumescent technique, and the super-wet technique. They will work with you to determine what method would work best in your situation. If you are a liposuction patient considering this surgery, please explore the links on the left to learn more. If you have more questions about whether liposuction is for you, please contact us info@theplasticsurgeryclinic.com to set up a complimentary consultation with Dr. Lista, Dr. Ahmad or Dr. Austin. Through a tiny incision a narrow tube, or cannula, is inserted and used to vacuum the layer of fat that lies deep beneath the skin. The cannula is pushed and pulled back and forth through the fat layer, breaking up the fat cells and suctioning them out. If many sites are being treated, your surgeon will then move on to the next area, working to keep the incisions as inconspicuous as possible. Fluid is lost along with the fat, and it’s crucial that this fluid be replaced during the procedure to prevent shock. For this reason, liposuction patients need to be carefully monitored and receive intravenous fluids during and immediately after surgery. The basic technique of liposuction, as just described, is used in all patients undergoing this procedure. However, as the procedure has been developed and refined, several variations have been introduced. Fluid Injection involves injecting a medicated solution into fatty areas before the fat is removed. The fluid – a mixture of intravenous salt solution, lidocaine (a local anesthetic) and epinephrine (a drug that contracts blood vessels) – allows the fat to be removed more easily, reduces blood loss and provides anesthesia during and after surgery. Fluid injection also helps to reduce the amount of bruising after surgery. The amount of fluid that is injected varies depending on the individual needs of each liposuction patient and the specific area being treated. Large volumes of fluid – sometimes as much as three times the amount of fat to be removed – are injected in the tumescent technique. Tumescent liposuction, typically performed on patients who need only a local anesthetic, usually takes significantly longer than traditional liposuction (sometimes as long as 4 to 5 hours). However, because the injected fluid contains an adequate amount of anesthetic, additional anesthesia may not be necessary. The name of this technique refers to the swollen and firm or “tumesced” state of the fatty tissues when they are filled with solution. Power Assisted Liposuction (PAL) is one of the newest liposuction techniques available and Dr. Lista was one of the first surgeons in Canada to use this method. In this technique a power source is used to rapidly oscillate the liposuction cannula 3 or 4 millimeters at a frequency of several hundred cycles per second. This allows the fat to be removed with less force, thus decreasing trauma to the patient. The fat is removed more quickly, more evenly and with less bleeding. This means that patients have less bruising and can recover more quickly following surgery. Your liposuction surgery can be performed right on site in the state-of-the-art facilities of The Plastic Surgery Clinic. If you prefer, you can choose to have your surgery at one of the hospitals where our highly skilled plastic surgeons, Dr. Lista, Dr. Ahmad and Dr. Austin, enjoy privileges. These include the Mississauga site of the Trillium Health Centre, where Dr. Lista was Past Chief of Plastic Surgery, and the University Health Network, where Dr. Ahmad and Dr. Austin continue to provide their services. No matter where you choose to have your surgery, there is always a surgeon on call to respond to your concerns. In addition, a board-certified anesthesiologist will administer your local or general anaesthetic, stay with you during the entire operation, and will be there as you wake up. The operation takes one to two hours. A friend or relative will need to come and pick you up from your surgery and stay with you for 24 hours after your surgery. Various types of anesthesia can be used for liposuction procedures. Together, you and your cosmetic surgeon will select the type of anesthesia that provides the safest and most effective level of comfort for your surgery. If only a small amount of fat and a limited number of body sites are involved, liposuction can be performed under local anesthesia, which numbs only the affected areas. The local is often used along with intravenous sedation to keep you more relaxed during the procedure. Regional anesthesia can be a good choice for more extensive procedures. One type of regional anesthesia is the epidural block, the same type of anesthesia commonly used in childbirth. Some of our Mississauga and Toronto liposuction patients prefer general anesthesia, particularly if a large volume of fat is being removed. If this is the case, a board-certified anesthesiologist will administer your local or general anaesthetic, stay with you during the entire operation, and will be there as you wake up. The best liposuction candidates are normal-weight people with firm, elastic skin who have pockets of excess fat in certain areas. You should be physically healthy, psychologically stable and realistic in your expectations. Your age is not a major consideration; however, older patients may have diminished skin elasticity and may not achieve the same results as a younger cosmetic surgery patient with tighter skin. When Toronto cosmetic surgery providers Dr. Lista, Dr. Ahmad or Dr. Austin meet with you to discuss your liposuction, the first thing they will do is listen: they listen to your needs; they ask you to describe, and have you bring in photos of, your ideal look. Your consultation will also involve a physical examination, including a careful medical history. Dr. Lista, Dr. Ahmad or Dr. Austin will spend as much time as you need to make sure both you and your surgeon know exactly what you want. It may not always be possible to meet all your expectations with surgery, so it is crucial that you understand what is a realistic outcome. Your surgeon will also instruct you on how to prepare for surgery in order to achieve the best result, including guidelines on eating, drinking, and taking certain vitamins and medications. Smokers should plan to stop smoking for a minimum of one or two weeks before surgery and during recovery, as smoking decreases circulation and interferes with proper healing. You will need to wear a lycra garment, similar to biking shorts, for 6 weeks. We will provide this garment to you to be worn under your clothes like underwear. You can start to shower the day after surgery, wash the garment, and then re-apply it. Pain pills are prescribed to help reduce post-operative pain. You should plan to take a week off after your plastic surgery procedure, limiting your activities to staying home, watching TV or reading books. It can be of great benefit to make arrangements in advance with a friend or family member for help with activities such as driving. If you are currently looking after small children, plan for an alternative childcare arrangement during this week to help limit the time you will need to spend on your feet. We understand it can be hard to stop completely, but staying quiet in the first week actually speeds healing and helps achieve the best results from the surgery. Most of our liposuction patients can begin gentle exercise in about 2 weeks. This means walking, stairmaster or treadmill walking is allowed but no running or high impact working out for one month. Liposuction is normally safe, as long as patients are carefully selected, the operating facility is properly equipped and the physician is adequately trained. At a minimum, your surgeon should have basic accredited surgical training with special training in body contouring. Also, even though many body-contouring procedures are performed outside the hospital setting, be certain that your surgeon has been granted privileges to perform liposuction at an accredited hospital. Your doctor must have advanced surgical skills to perform procedures that involve the removal of a large amount of fat (more than 5 litres or 5,000 ccs); ask your doctor about his or her other patients who have had similar procedures and what their results were. Also, more extensive liposuction procedures require attentive after-care. Find out how your plastic surgeons plans to monitor your condition closely after the procedure. Dr. Lista, Dr. Ahmad and Dr. Austin are two highly skilled, board-certified specialists in plastic surgery in Canada. Dr. Lista is also board certified in the United States as a diplomat of the American Board of Plastic Surgery, making him one of only a few plastic surgeons to be board certified in both Canada and the United States. Dr. Ahmad is also board certified in Ireland. Nevertheless, while a well-trained surgeon and a state-of-the art facility can reduce the risk of complications, there are no guarantees. Though rare, complications can and do occur. Risks increase if a greater number of areas are treated at the same time, or if the operative sites are larger in size. This can increase the chance of infection; delay healing; cause the formation of fat or blood clots that may migrate to the lungs and cause death; excessive fluid loss, which can lead to shock; fluid accumulation that must be drained; friction burns or other damage to the skin or nerves; a perforation injury to the vital organs; and unfavourable drug reactions. Make sure you discuss the potential risks and complications with your surgeon in detail, especially the particular risks associated with the newer techniques. The scars from liposuction are small and strategically placed to be hidden from view. However, imperfections in the final appearance are not uncommon. The skin surface may be irregular, asymmetric or even “baggy,” especially in older liposuction patients. Numbness and pigmentation changes may occur. Sometimes, additional surgery may be recommended. Dr. Lista, Dr. Ahmad and Dr. Austin are three highly skilled, board-certified specialists in plastic surgery in Canada. Dr. Lista was one of the first surgeons in Canada to use the new Power Assisted Liposuction technique that removes fat quickly and is less painful for the patient, leading to faster recovery times. Dr. Lista, Dr. Ahmad and Dr. Austin are both committed to helping you safely achieve a look that is natural and aesthetically pleasing. You will see a noticeable difference in the shape of your body quite soon after surgery. However, improvement will become even more apparent after about four to six weeks, when most of the swelling has subsided. About three months after liposuction, any persistent mild swelling usually disappears and the final contour will be visible. If your expectations are realistic, you will be very pleased with the results of your surgery. You may find that you are more comfortable in a wide variety of clothes and more at ease with your body. By eating a healthy diet and getting regular exercise you can help maintain your new shape. We understand that it is very helpful to view actual photos of liposuction results when considering the procedure. Some of our liposuction patient photos are available in our liposuction photo gallery. If you’d like to see more, a larger collection will be available during your complimentary consultation with one of our expert plastic surgeons. Liposuction is not normally covered by OHIP or other provincial health care plans. Most corporate benefit plans do not cover the procedure, either. The Plastic Surgery Clinic does have financing options available, however, so that you can reach your goal sooner. In a complimentary consultation your plastic surgeon will give you an accurate quote of what the surgery will cost, as it can depend on many different factors. At The Plastic Surgery Clinic, we want to help you reach your goal, and the first step is a phone call. To find out more about the cost of liposuction, please contact us by phone or e-mail or by filling out the Request for Information form below.